I have to visit my office in Newark for a few days and was scheduled to take a 3:50 flight today from Manchester, NH to Newark. I’ve spent the entire day here at the airport and I’m still here and now United says the flight will leave at 8:31. Even if United eventually comes up with an airplane for us I’ll have a hard time reporting the election results tonight. I suggest you use the County site to find out the election results because I probably won’t be able to post them until morning. Click on the image below to go to the County results page. This was written by admin. Posted on Tuesday, November 6, 2018, at 7:10 pm. Filed under Uncategorized. Bookmark the permalink. Follow comments here with the RSS feed. Post a comment or leave a trackback. Can the dems hire Connolly before January? I hope not! 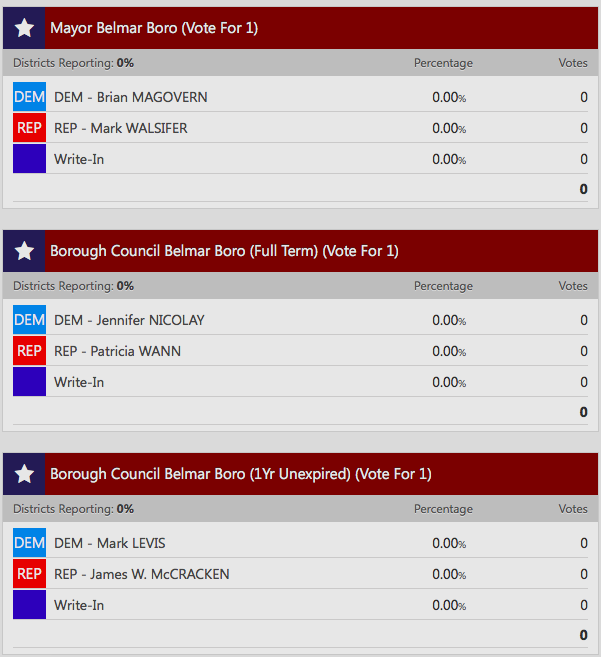 looking good….could it be a win for Walsifer, Wann and McCracken??? I was told Walsifer ,Pat and Jim are all ahead tonight with approx 600 mail ins and provisionals . Mark is ahead by about 203 so I think all the Republicans are looking good. correct me if I’m wrong. Well, it looks like a clean sweep for our candidates – for now. I hope the numbers stand. Now let’s get back to what govt. is supposed to do like make sure the garbage gets picked up and stop all the other extracurricular hijinks govt. has been up to for the last few years in this town. Queen Mean should not appointed CFO she does not represent the new administrations ideas . If Magoo appoints her he definitely shows he does not have belmars best interest in mind. ‹ Will Their Dunes Hold?